And given a bit of a shine to boot. RISC OS may not have built in support for WiFi, but there are tricks that can be employed in order to benefit from wireless connectivity. One of those tricks is to run Linux on a board that does support WiFi, and hitch a ride on that board’s connection. That may sound complicated to those who lack the tecnical knowhow, but there are a couple of solutions available to simplify the whole process. One of those solutions is Wispy, from RISCOSbits, which utilises the wireless connection on an Orange Pi Zero. Connected to your computer by a short network cable, the board is small enough to be discreet – indeed, on some systems it can be housed interally in the main case – and bridges the gap between your RISC OS computer and a wireless network connection. 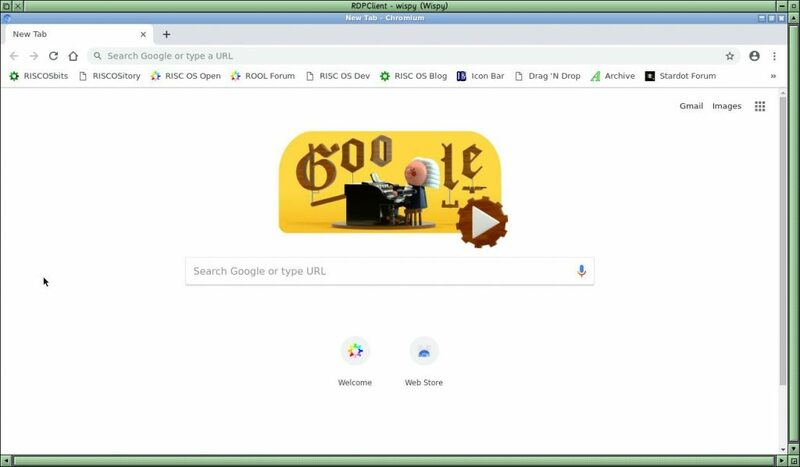 It also provides a number of other benefits, such as the ability to run Linux software via Remote Desktop Protocol (RDP) in a window on your RISC OS desktop – most notably, including a more fully featured web browser than we currently have running natively on RISC OS. Until recently, the browser supplied as part of Wispy was Firefox, but the version supplied since the launch of Wispy in October 2017, based on Firefox 45 from late 2016, had fallen into an update trap due to changes in the compatibility of newer versions with various Linux distros, including the one on which Wispy is based. As a result, users of the software were finding that Firefox was reporting itself to be out of date, and that it may have security issues – a problem that needed to be addressed. An interim fix saw Firefox updated to version 52, but that was still old enough to trigger warnings about it being out of date, so a more recent fix saw Firefox replaced with Chromium – initially version 71 for beta testers, but since updated to version 73. This performs just as well as the initial version of Firefox that was included, but being more up to date benefits from greater security. In addition to replacing a key component in the Wispy disc image for the Orange Pi, the image itself has been changed from an 8GB one to a 16GB one, thus meaning there is greater capacity on your microSD card for additional Linux software, files, etc. RISCOSbits’ Andy Marks asks that existing customers contact the company directly for an upgrade to the new version, which can either be obtained by returning the original microSD card to be updated, or preferably by downloading the new image for writing to a suitable card. For those interested in obtaining Wispy for the first time, he also adds that the company is no longer supplying Orange Pi Zeros due to issues obtaining them, but those willing to source their own can get in contact for details of the software element.